Aquarium like scenery, deep-sea coral and sponge gardens (an extremely rich and rare habitat), hungry groupers and sharks, as well as a frenzy of deep-sea eel-like creatures: the Three Kings Islands have it all for you. In April 2010, a team of five scientists from Te Papa and Massey University have been carrying research for about a week around the Three Kings Islands. These isolated stacks of rocks are located about 50km North of Northland and are stunning place to work. In addition to a feeling of being at the end of the world, this place is special for marine scientists because it is at the intersection of different water masses, concentrating an extremely diverse underwater fauna. I probably lost hair during the week because of this, but in the end, everything ran smoothly and we deployed our video systems over 50 times, capturing some very neat footage. I have been reviewing them here in the lab and wanted to share some of the interesting sections with you. 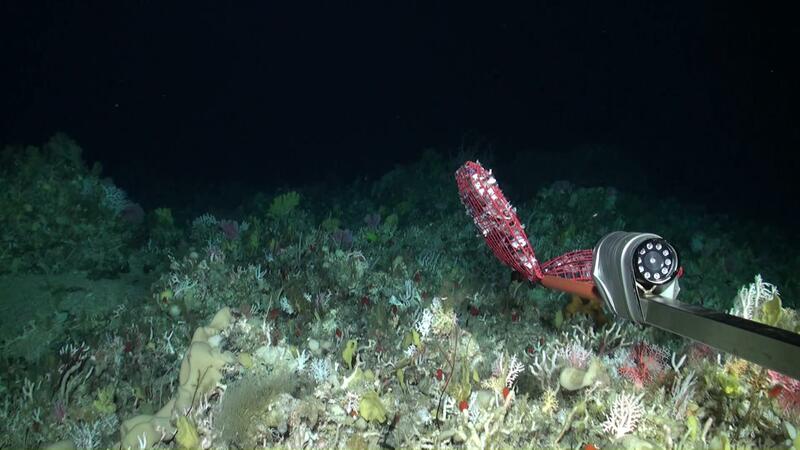 One of the highlight of the fieldwork was the discovery of extended deep-sea coral and sponge gardens at depths ranging from 300 to 700m. This complex habitat is composed of a mixture of coral species that are adapted to the deep-sea conditions, i.e. they do not need light like their shallow-water associated species to thrive. Although poorly studied, we know that those habitats are rare, fragile and harbour a significant amount of biodiversity. They can also be important spawning and nursery grounds for many fish species. Seeing this habitat for the first time with such clear video images was soul-stirring for the team. If you want to know more about this project, you can visit the home page of the fish team. Vincent Zintzen, Te Papa researcher.